These days, companies are almost always focused on the Now. And the recent recession exacerbated that tendency. Industry expert Brent Grover’s latest book will help you shift that mindset. 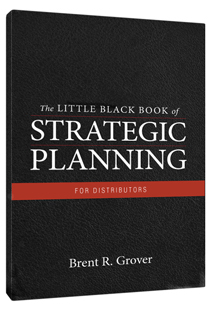 The insights in The Little Black Book of Strategic Planning for Distributors will help you and your facilitator organize a strategic planning project, gather the needed information and build a one-page plan. Execution is the final step, and it is where many distributors fail. You will need a system to monitor results and take corrective action. This book includes what you will need to put your plan into action – a plan specifically tuned for a wholesale distribution company. This is the first book from Brent Grover that is published by Modern Distribution Management. Sign up to receive periodic updates on book promotions and the latest news from Strategic Planning for Distributors.